This morning marks exactly 9 months since we landed here in Samoa. It’s weird how in some ways it feels like we just got here, and the last 9 months has gone by in the blink of an eye—and on the other hand, it feels like we’ve been here forever. And the baby's due any day now. Haha. Just joking! 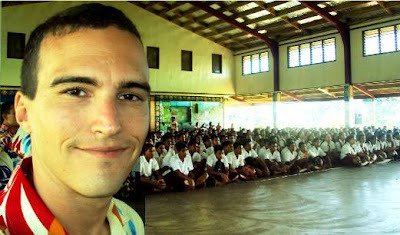 Many Peace Corps were in town for the Easter holiday since Samoa essentially shuts down for 5 consecutive days. A lot of volunteers come into Apia because getting around and hanging out is easier in town on such holidays than in the village. The rest of April felt a little like marking time until school break in May. 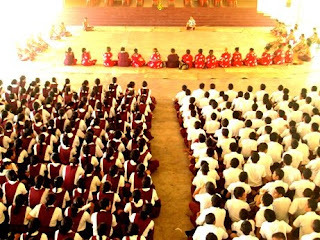 At my school we simultaneously prepared for midyear exams and Culture Day, which we celebrated 2 days before the last day of school. 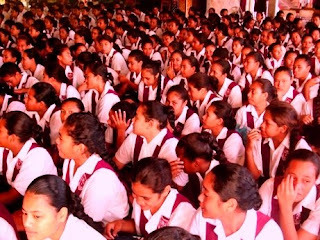 Culture Day is a pretty big deal in schools across Samoa, and at times it’s difficult to discern whether exam studies or Sasa practice takes priority. Culture Day was extravagant and fascinating and my team won. So I guess I’m cool with it. 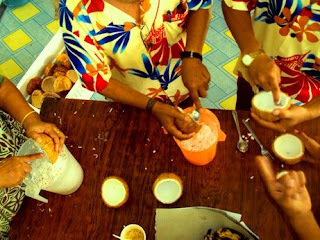 Meanwhile, much of Peace Corps Samoa descended on Lusia’s Lagoon Fales to celebrate Cinco de Mayo. It was a good time, albeit expensive. My parents were scheduled to arrive at 5:35 a.m. on my school’s Culture Day, but their flight from San Francisco was delayed and they missed their connection in Los Angeles. So they had to go through Auckland to get here, and they arrived two days later at 5:35 a.m.
Their stay was fun though. We hung out in Apia, visited the host family, took the ferry to Savai’i, and hiked to Robert Louis Stevenson’s grave. Good times all around. There were 3 days between when my parents left and group 81’s Early Service Conference. All except Joey met up at the Peace Corps office, where we vanned down to Saleapaga for the week. We stayed in beach fales, ate Samoan food, and kvetched for 3 days. It was refreshing. We were back in town on Thursday. I attended a VAC meeting Friday, after which I caught the Aggie Grey’s shuttle for the airport. My plane took off just before midnight on May 22, and I landed in Auckland on May 24. May 23, 2009, I never knew you. I met up with Luisa in Auckland where we brunched at the Sky Tower, walked through the rain in Paihea, did a wine tour of Waiheke, and frequented Starbucks whenever we could. I stayed on two days after Luisa left, which I spent consuming Kiwi Mexican food. I arrived back in Samoa to catch the tail end of Independence Day. The best part was they turned on the Christmas lights that line the streets of Apia. I think I would have preferred to go back to school then, but we had another week of break, and teachers began to grow loopy. School started just in time—although “start” is a generous term. My school spent a week and a half calculating grades for first term. Also, my principal informed me that the other computer teacher quit, so I have been teaching 29 of 30 periods per week so far this term, which has been lousy, but hopefully the situation is temporary. July has been a busy month with our Interchurch Athletics Day last Friday and 4th of July at Robert Louis Stevenson’s on Saturday. The US Navy is in town, as is Greenpeace. And today we canceled school to play host to a girls’ school from Auckland. It’s good, man, how are you? If I come visit, can we just hang out on the beach for a week? There are surprisingly few beaches in the Apia area. But please come. I have a couch. You are welcome any time. And we’ll find our way to the beach. And when we’re not at the beach, we can find other things to do. What’s the most people you’ve had stay at your place? Do all Peace Corps have their own housing? I’ve had 5 people sleep here on a couple of occasions, which means one on the bed, one on the couch, and three on the floor. The floor’s comfortable though. 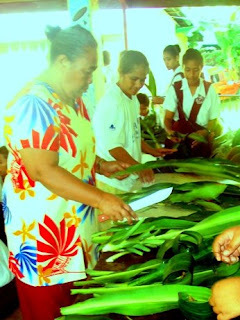 Not all volunteers in Peace Corps Samoa live in their own dwelling space. Most of the teachers do, but most of the village-based kids do not; they live with host families. Can you upload some video, or does that take too much memory? I have a couple videos (e.g. Savai’ian dance from Culture Day, Toa Samoa cheer, Lions roaring at the Auckland Zoo, etc. ), but I think it might take the rest of my time here to upload video via my dial-up connection. Maybe one of these times I’m at the Internet café I’ll give it a whirl. Is palusami good? What about vaisalo? Oka? Kokoesi? Miti? Pe’epe’e? There are many Samoan foods I like a lot, and there are some I try to avoid. 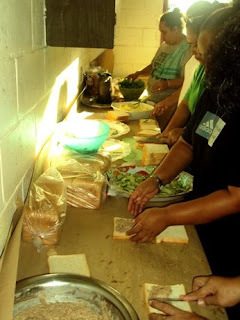 Tuna sandwiches were served at lunch today, which I didn’t touch, but I did have at least 3 helpings of vaisalo. I like oka a lot, but not as much as Paul. 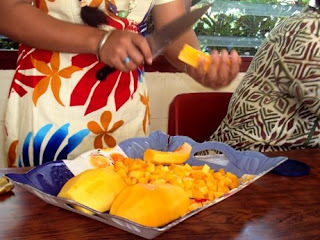 Kokoesi is great, as is pe’epe’e on just about anything. Miti is good for dipping breadfruit, but I can’t sip it. Blakey and Dan love palusami; I find quality and temperature can vary greatly. Not at all! I enjoy comments. Please comment. From Marques: Was the "Disk Read Error" on a floppy disk or on a hard drive? The error is on the hard drive, I believe. It’s the first thing that pops up after the BIOS runs. There are no CDs or floppy disks in the system unit. Do you think it’s fried? Tomorrow starts a new round of cultural exploration. 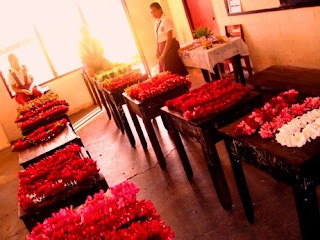 Tomorrow’s topic will be faleoloas. 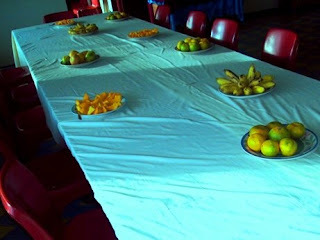 Pictures from preparing for the Auckland girls school visit below. Ulas ready to be leid on the visitors to the visitors. 'Ava ceremony at the assembly. Your adventures reminds of the first season of 'Scrubs.' JD and his peers were pretty green for the first few seasons and that's what made the show interesting. When are the newbies due? Did you get to meet Keisha Castle Hughes, I heard she was part of that trip on Greenpeace. She is of the Whalerider movie. I like the way your blog always loads easily and quickly. I have linked it to my wiki as samples of blogs I follow. Hearing you speak of the food is always fun. Ao ao lava lou gagana Samoa. Unfortunately, I do think the hard disk is fried. The "Disk Read Error" typically comes up when the computer can't read the hard drive at all. I think I had that issue a few times while there - humidity and just natural wear and tear can do that. Very fun to read today. I can't believe you've been there 9 months! We miss you but it's very fun reading about all that you are doing and observing and enjoying!